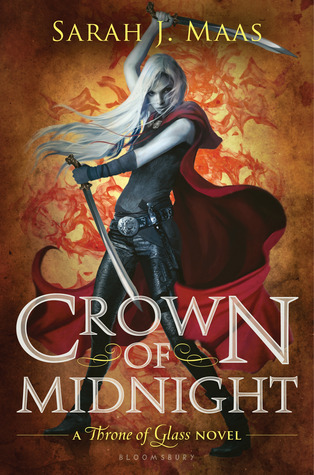 Review In A Nutshell: Crown of Midnight is the perfect sequel, expanding on the epic world of Throne of Glass while giving amazing character development and a gripping plot. Crown of Midnight follows Celaena Sardothien after the events of Throne of Glass. Celaena has earned her spot as King’s Champion but feels no loyalty toward the cruel King of Ardalan. She continues to try to unravel the secrets that lurk in the glass castle, risking the relationships she’s building and her life. Each book shows more and more of this fantastic world. Each layer revealed is fascinating and well developed. I’m always surprised by the magic unveiled and how the mysteries are explained. Sarah J. Maas’ voice is absolutely brilliant and she does such a fantastic job of immersing the reader into this elaborate world. The plot of Crown of Midnight is full of mystery, action, and betrayal. There was plenty of action, humor, and romance, and never a dull moment. There are so many twists in this book as well! While some can be a bit predictable (if you read the genre a lot), there is always a refreshing edge to them that still make it exciting. I love each and every one of these characters. They remain just as fascinating and multi-faceted as in the first novel, plus their growth in this book is absolutely amazing. The relationships all develop beautifully as well. While I was 100% team Dorian in Throne of Glass, Sarah J. Maas is able to manipulate my emotions so perfectly that I really didn’t mind that Chaol gets the spotlight in this book. But Dorian is still my love and I want to protect him. Speaking of protecting characters- god this book hurt me. From character deaths to relationship deaths, I was a mess the entire time I was reading. But I think that’s why it’s so good- these characters feel so real and human that when anything happens to them, there is no way to detach yourself from them. “If they wanted Adarlan’s Assassin, they’d get her. Cons– Why??? Why did this book have to hurt me so much??? Crown of Midnight is an amazing sequel, that all fans of Throne of Glass need to pick up. Even if you weren’t a fan, still pick it up. It is absolutely amazing.